– Tom Jones kicked things off by singing “Thunderball”, to mark the 50th anniversary of the Bond movie franchise. Meh. Everyone knows the best Bond theme is “Live and Let Die”! – Stephen Fry made for a particularly hilarious and charming host… shame he doesn’t do as many sketch shows and sitcoms as he used to. – Kristen Wiig and Chris O’Dowd did a funny little skit together before announcing the winner of the “Outstanding Debut by a British Writer, Director or Producer” Award… but they weren’t just there to present awards, they were also nominees! Wiig was up for “Original Screenplay” (Bridesmaids), and O’Dowd was nominated for the interactive “Orange Wednesdays Rising Star Award”. Sadly, they both went home empty-handed (well, I say “empty-handed”, but the nomiee gift bags were heavy with loot). – Helena Bonham Carter looked gorgeous (and reassuringly gothic) while presenting the award for “Supporting Actor”… and it was nice to see that Tim Burton was there to act as her arm-candy for the evening. – Although Fry introduced her as a “Bond Girl”, Naomie Harris made a point of referring to herself as a “Bond Woman”, while presenting the award for “Outstanding British Film”. Is it really worth trying to make that distinction? Either way, it’s a little sad that the British film industry’s flagship fictional “ambassador” is a sexist, sociopathic bed-hopping assassin. Sigh. – I thought it was a bit mean of them to use a clip of Melissa McCarthy pooping in a sink to illustrate her nomination for “Supporting Actress” (Bridesmaids). 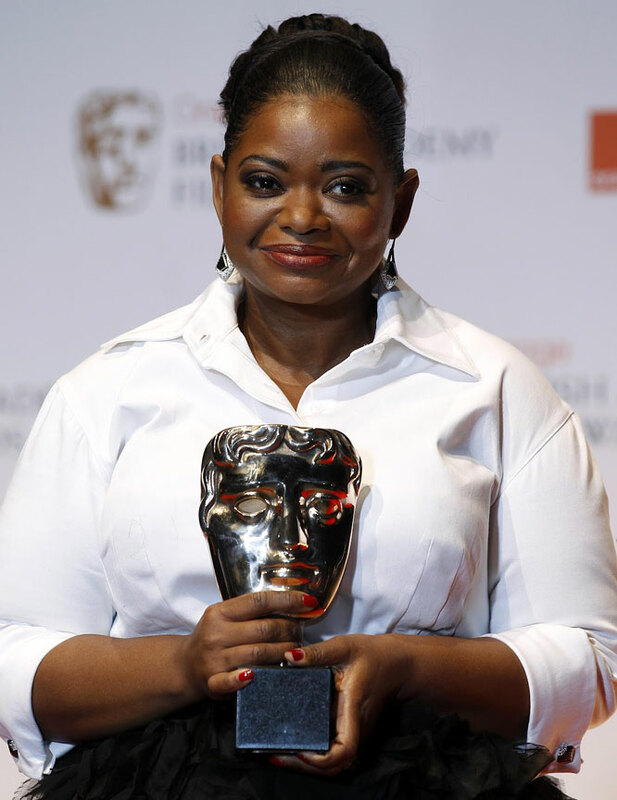 No surprise they eventually gave the award to Octavia Spencer (The Help) instead… did the two of them have any scenes together in The Nines? I can’t remember. Anyway, Spencer gave a very sweet and sincere speech about how we can all relate to stories of oppression and prejudice, regardless of our nationality, race, etc. – Christina Ricci co-presented the “Original Screenplay” Award, and sounded like she had a bit of a croaky throat. Considering how low-cut most of the women’s dresses were, and how cold the weather is right now, I’m surprised that any of them stopped to be photographed and/or interviewed on the red carpet! I hope someone was warming up mugs of Lemsip for them all, inside the Opera House. – Tilda Swinton looked very pretty and appreciative throughout, despite winning naff all. I’m tempted to watch We Need to Talk About Kevin for her performance alone, although it isn’t really my cup of tea. Note: Am I crazy, or has Hanna been totally (and egregiously) snubbed by everyone? This entry was posted in Rants about Films and tagged Bafta Film Awards, Bridesmaids, Christina Ricci, Gothiness, Helena Bonham Carter, Kristen Wiig, Melissa McCarthy, Naomie Harris, Octavia Spencer, Tilda Swinton. Bookmark the permalink.